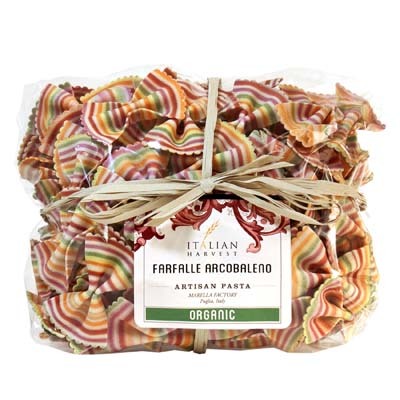 Another fun and colorful creation from pasta maker Marella, this bag of Farfalle Arcobaleno Rainbow Bowties can be great and fun dishes for you and your family. All its pretty colors come from natural dyes. And the hues remain as bright and sharp even when you cook them. Moreover, it has all natural and organic ingredients, which means zero harmful preservatives. This pasta are best with light sauces. Drizzle some olive oil and garnish with ground black pepper, or simply toss with melted butter and Parmigiano. Whichever recipes you follow, you’ll sure to get a delightful and scrumptious pasta dish. This is another lovely creation from award-winning Italian pasta maker Marella you wouldn’t want to miss. So place your orders now!